We’ve had a lot of rainy days this fall, which means I’ve been searching for indoor activities that occupy my kids’ attention (for more than 15 minutes) and are alternatives to the TV. 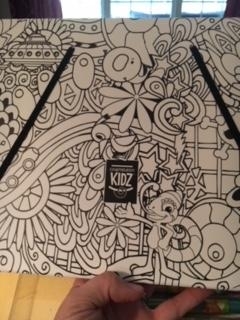 Luckily, I recently discovered Chameleon Kidz Blendy Pens, which have transformed the activity of coloring for my children… and for me! One rainy morning I broke out the Blendy Pens jumbo kit, which includes 24 pens, 12 fusion chambers, two posters, two stencils and a Blendypen airbrush. What’s a fusion chamber, you ask? 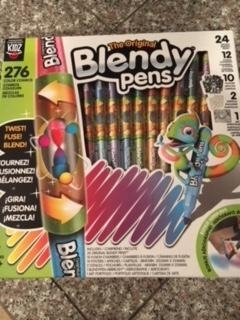 Well, the unique aspect of Blendy Pens is that when you combine two of the 24 pens in a fusion chamber, and then twist, the colors fuse together, so you get a wide variety of color gradients to add to your coloring pages! If you’re looking for a bluish-green color to color a pictures of the ocean, for example, just fuse a blue and a green together, twist and voila! You have a beautiful combination color that fades softly as you color, thus giving your pictures a realistic, ever-changing look instead of a blocky, two-dimensional appearance. The included airbrush tool also allows you to attach it the end of a pen, and lightly blow through the indicated hole to achieve an edgy airbrush look. This would be a great effect on any pre-created coloring page or if you have children who are budding artists and want to create their own pictures. Did I mention the jumbo kit also includes an art portfolio for keeping all of your tools and masterpieces? Plus it features a black and white “ready to color” look so young artists can carry their materials around in style. As a fan of coloring tools/books myself (I have a whole stack that I promise to work on some day), I gave the pens a try, too. 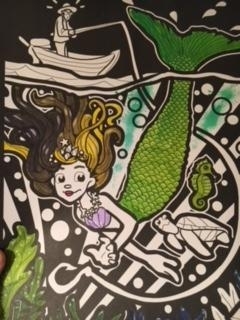 I’m no artist, but I loved the effects of the “fused” colors (you can see a good example on the mermaid’s hair and tail, below). If you have a child with a creative side, these pens are the perfect holiday gift this season! 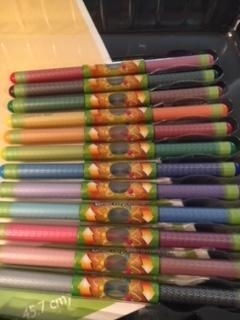 Blendy Pens come in several different kit options, including the aforementioned Blendy Pens Jumbo Kit (24 markers), the Large Kit (20 markers), the Small Kit (8 markers) and the Stationery Set (6 markers). Be sure to visit the Chameleon Kidz web site to learn more about each of these kits and to get information on where these products can be purchased! For a limited time, enter to win a free Jumbo Kit! Please enter to win before November 30, 2017. Open to U.S. winners only.